New Hampshire lovers, let the adventure begin here! 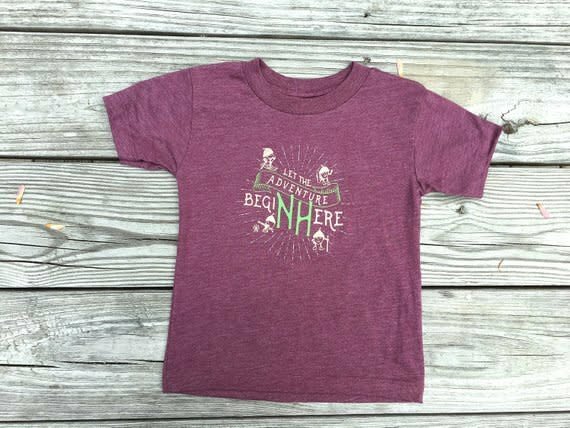 Pint-sized Granite State locals and visitors alike will love this playful kids' T-shirt featuring adventurous acorns partaking in some of New Hampshire's most popular activities: skiing, hiking, camping, and roasting marshmallows by a campfire. The text reads: "Let the adventure begin here" with "NH" prominently featured in the middle. 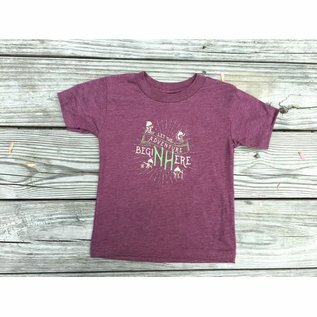 This toddler shirt is in heather maroon. The fabric is soft, smooth and lightweight. The hand-drawn illustrations appear on the front side only. These tees are a whimsical addition to any young New Hampshirite's wardrobe as they experience all their state has to offer. They also make a great gift for visitors, out-of-state family and friends, or travelers who want a keepsake that captures the magic of their own New Hampshire adventures. • Toddler unisex sizes; fits true to size.